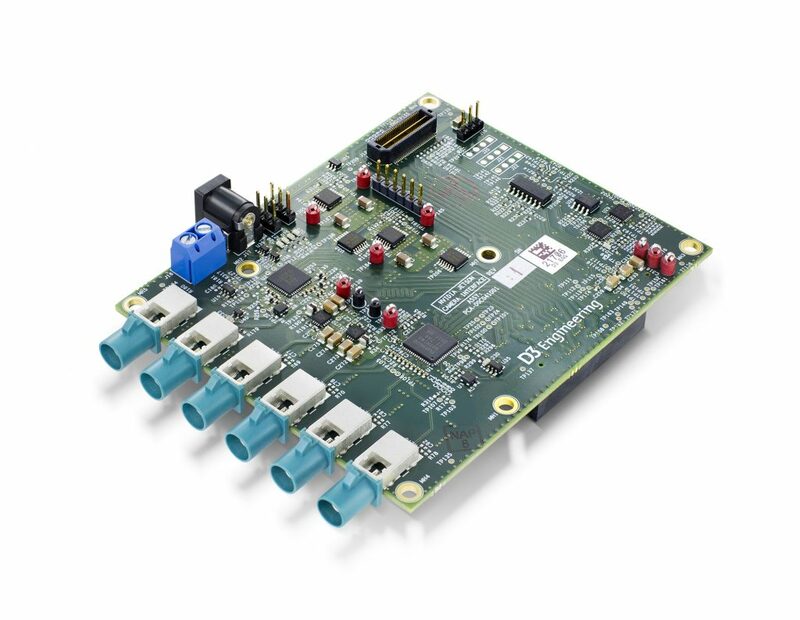 Rochester, NY – Sept. 20, 2018 – D3 Engineering announces its DesignCore® NVIDIA® Jetson™ SerDes Sensor Interface Card for the NVIDIA Jetson TX1/TX2 and Jetson Xavier™ Developer Kits. Engineers can use the card to easily interface multiple cameras and other sensors to the Jetson platform for realistic benchtop evaluation and rapid proof-of-concept development. The two most popular SerDes standards are both available on this card: FPD-Link™ III from Texas Instruments and GMSL2 from Maxim Integrated. Each sensor stream comes in over a serial link and is de-serialized into MIPI CSI-2 data for the Jetson Developer Kit. A MIPI CSI-2 input enables direct connection to the Jetson platform. GPIO and I2C control are available for configuration, synchronization and reset. The card takes a 12V external supply and has a power-over-coax connection. D3 Engineering provides rugged camera modules, camera modules, radar sensors, and software design examples for use with the SerDes card. The company also offers engineering design services to interface other sensors or create new Jetson-based embedded system to meet OEM requirements. Learn more about D3 Engineering and NVIDIA. D3 Engineering provides embedded electronic design services and OEM products for original equipment manufacturers in the industrial, transportation, infrastructure and commercial sectors. Using its proven DesignCore® platforms and proven stage-gate development process, D3 Engineering helps its partners minimize the cost, schedule, and technical risks of new product development for performance-critical applications. D3 specializes in autonomous systems, embedded vision, and connected automation. The company provides hardware design, firmware design, validation testing, transition to production, and OEM products. Learn more at www.D3engineering.com.